Nearly a year after the tsunami, 1.5 million people are still living in tents, barracks and temporary homes, but reconstruction efforts will pick up speed next year, international aid groups said Wednesday. In Indonesia, Sri Lanka and India, the countries hardest hit by the killer waves, land rights issues, a shortage of construction materials and government indecision initially slowed efforts to get survivors out of emergency shelters. The tsunami that swept across the Indian Ocean left at least 216,000 people dead or missing in 12 countries, the majority in Indonesia's Aceh province. 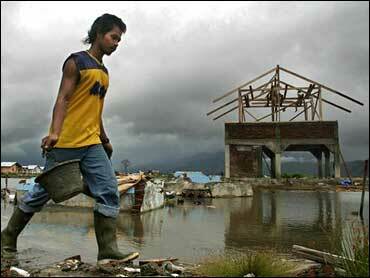 Roads and ports were swept away, making it hard to get to some of the most devastated areas. As result, only 20 percent of the 1.8 million people displaced by the tsunami are in permanent housing, Britian-based Oxfam International said as it and other aid organizations released reports reviewing their work so far. While most of the displaced are staying with host families, tens of thousands still live in crowded tent camps, where they are pounded almost daily by monsoon rains, and frustration is starting to mount. But Oxfam noted that even rich countries struck by natural disasters can struggle for years to rebuild, citing earthquakes in Japan and Iran, any of the obstacles that were blocking reconstruction have since been removed. "We had certain expectations about how quickly we'd be able to move forward and we haven't met all our marks," said Paul Dillon from the International Organization for Migration, which is building transitional homes. "But at the same time, we're very well placed for 2006," he said. "We're going great guns." Foreign government and private donors pledged more than $7 billion for reconstruction and rehabilitation across tsuanmi-affected countries and thousands of international aid workers poured into the region to help. While they succeeded in setting up emergency shelters quickly, saving thousands of lives, many did not have the experience or expertise to carry out mass projects to construct homes, Oxfam said. "Few humanitarian agencies had ever faced need on this scale, spread over such a wide area," said the group, which has helped provide clean water and sanitation to survivors, clear agricultural land and revive livelihoods. Some of the things that stalled efforts to get people out of tents, barracks and the homes of family and friends were unavoidable, Oxfam said, noting that land in Aceh that once housed 120,000 people was permanently submerged under the water. Communities also needed to provide input about the types of houses they wanted. "The reality is that rebuilding at speed involves a difficult balancing act: people want houses quickly but they also want to be consulted and the houses to be of top quality," said Oxfam's director Jeremy Hobbs. "In some cases the rebuilding process may actually have been too fast." But other delays should have been avoided, the group said in its year-end report, noting that governments were slow to allocate new and appropriate land for rebuilding and there was often little clarity over coastal buffer zones. "Are we happy with the progress in Aceh? No, we are not at all," said Andrew Steer, the World Bank's country director for Indonesia, which is donating money to Aceh's reconstruction. He said officials and nongovernment organizations initially promised more than they could produce. "We should have figured out the simple arithmetic, which was that you simply can't build more than 30,000 (permanent) houses in the first year," Steer said. In Indonesia, 18,149 of the minimum 80,000 permanent shelters needed will be completed. In Sri Lanka, approximately 5,000 permanent houses out of the 78,000 needed will have been built. In India's worst affected state, Tamil Nadu, the government plans to build 130,000 permanent homes. So far only 1,000 have been completed.